Here at Bamboo Beads & Bling we create jewellery using the finest materials at our disposal. All of our Artisans have had years of experience working with semi-precious gemstones and a variety of jewellery making supplies. If you do not see a design that suits you we may be able to come up with a solution for you. Druzy is a configuration of many tiny crystals like a "skin" of sparkly crystals that have grown over another crystal or matrix. They are known to bring light and joy to the surrounding environment. 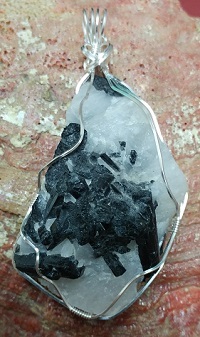 Like other types of clusters, they can empower the energy of other crystals and stones. 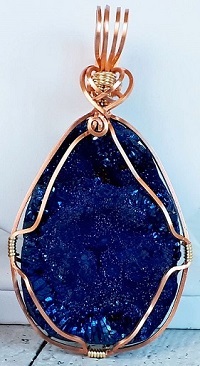 Description: Cabochon Wire Wrap on Titanium Druzy using Copper artistic wire. Increases flexibility, happiness, objectivity, compassion & serenity. Enhances tolerance & understanding. Opens one to accept love. 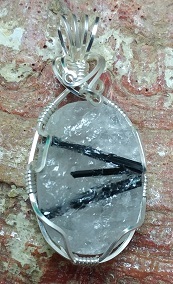 Description: Cabochon Wire Wrap on Quartz with embedded Tourmaline using Silver plated artistic wire. Agate is a good protective energy stone for children and adults alike. It has calming and soothing properties and is said to be the stone of harmony. 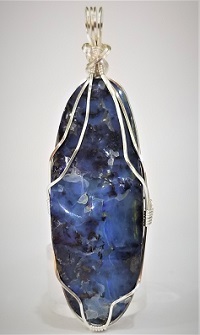 Agates are known to enhance creativity, stimulate the intellect, and ground the emotions. Works with chakras according to stone colour. 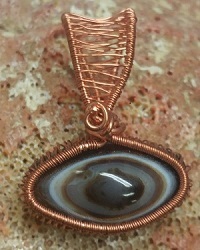 Description: Woven Wire Wrap on Agate Eye using Copper artistic wire. Labradorite is a stone of transformation. It is said to clear, balance and protect the aura. It has been used to provide clarity and insight into one�s destiny as well as attract success along the way. Helps to reduce stress and anxiety. Solar Plexus and Brow Chakras. 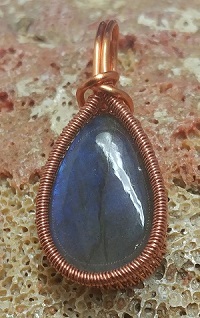 Description: Woven Wire Wrap on Labradorite using Copper artistic wire. Moss agate is sometimes called the "gardener's stone" due to its mystical properties of helping ensure a full crop. Moss agate is said to bring general abundance, success, & prosperity. Helps one gain peace with extreme or excessive duties in life and brings self-confidence and higher self-esteem. Associated with the Heart Chakra. Description: Woven Wire Wrap on Moss Agate using Silver plated and Copper artistic wire. 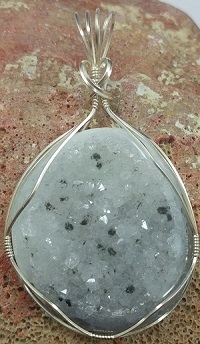 Description: Cabochon Wire Wrap on Agate Druzy using Silver plated artistic wire. Kyanite is the stone of channeling, altered states, vivid dreams, dream recall and visualizations. This stone aides in bringing loyalty, honesty and tranquility. Helps to diminishes anger and confusion because it does not retain negative energy. Aligns and balances all chakras. 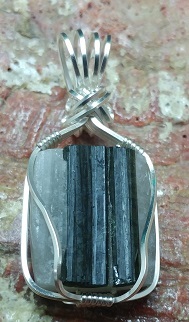 Description: Cabochon Wire Wrap on Black Kyanite using Silver plated artistic wire. Helps with change & spiritual evolution. Very protective stone. Helps balance pure love, romance, & one's own well-being. Stone of good fortune & prosperity. 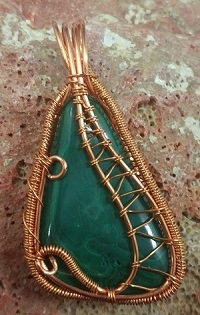 Description: Woven wire wrap on Malachite using Copper artistic wire. Ocean Jasper is a very soothing and protective stone that helps one to love one�s self as well as others. It aides with healing the emotions and brings peace of mind by helping to increase patience. It also helps to encourage a feeling of joy and elevated spirits. Associated with the Heart and Solar Plexus chakras. 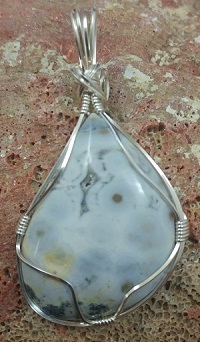 Description: Cabochon Wire Wrap on Ocean Jasper with Silver plated artistic wire. Description: Woven Wire Wrap on Glass Arrow with Silver plated artistic wire. Stone of resolution & perseverance. Helps communication of all kinds. Wonderful stone for meditation. Balances the Yin/Yang energies. Helps one allow other people into their lives, even if one has been reclusive or solitary. 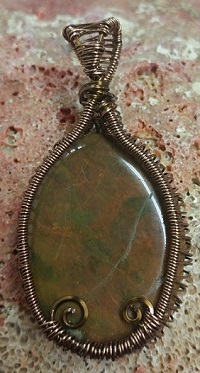 Description: Woven Wire Wrap on Rainforest Jasper with Vintage Bronze plated artistic wire. Stone of creativity, individuality and courage. Aids memory, including recall of past lives. Helps ease or remove sorrows. It also helps stabilize energies in the home. Root and sacral chakras. 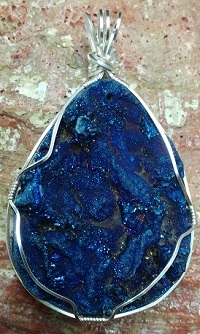 Description: Cabochon Wire Wrap on Titanium Druzy with Silver plated artistic wire. 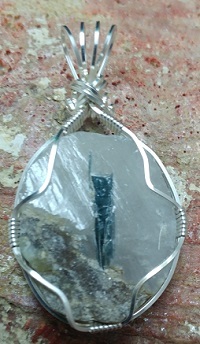 Description: Cabochon Wire Wrap on Green Tourmaline with Silver plated artistic wire. 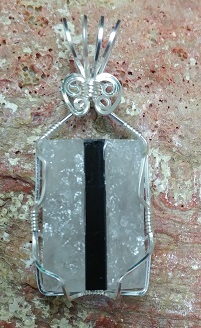 Description: Cabochon Wire Wrap on Black Tourmaline with Silver plated artistic wire. 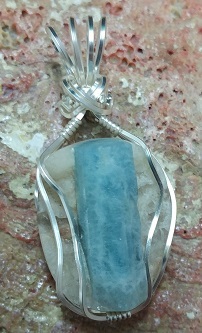 Description: Cabochon Wire Wrap on Aquamarine with Silver plated artistic wire. 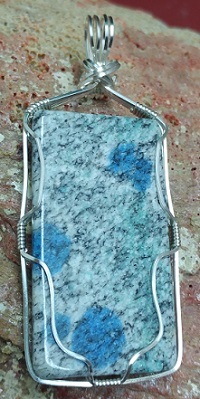 Description: Cabochon Wire Wrap on Blue Tourmaline with Silver plated artistic wire. Named after K2, the world�s second hightest mountain in Karakoram mountain range in the Himalayas, this stone allows one to reach the highest �peaks� in one�s consciousness. It aids with intuition, clarity and mental focus. Associated with the Third Eye Chakra. 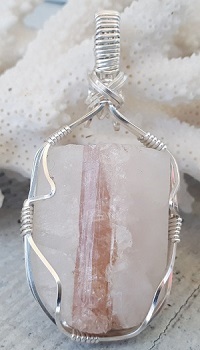 Description: Cabochon Wire Wrap on K2 Stone with Silver plated artistic wire. Known as "the healer's stone" because of its great ability to enhance healing. Strengthens spirituality, psychic ability & channelling. Helps perfect spiritual love & open the heart chakra to unconditional love. lowers hostility, anger, jealousy & prejudice & gives a sense of freedom. Third eye and crown chakras. 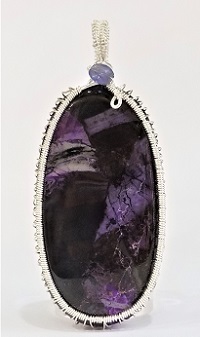 Description: Sterling Silver Woven Wire Wrap on Sugilite with Tanzanite. Known as the �stone of good fortune�, it has been credited with bringing prosperity and abundance. It is said to attract prosperity into one's life and strengthen personal will as long as it is aligned with the highest good. 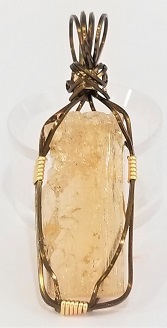 It is believed that this topaz will assist to overcome self-imposed limitations, and to recognize one�s abilities to move forward with an open heart. 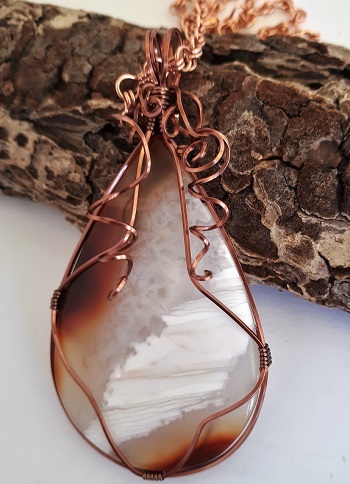 Description: Cabochon Wire Wrap on Imperial Topaz Stone with Bronze artistic wire. Ammolite is rare and valuable opal-like organic gemstone found primarily along the eastern slopes of the Rocky Mountains of Alberta. It is formed by irradiant layers of mother-of-pearl that coat the outside of some types of ammonite fossils. 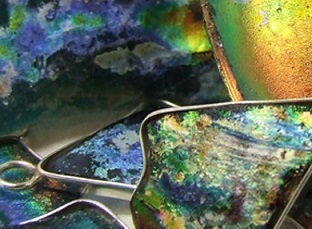 An iridescent opal-like play of colour is shown in fine specimens, mostly in shades of green and red. 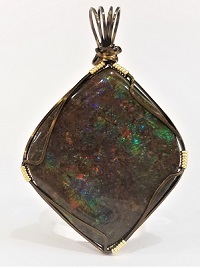 Description: Bronze Cabochon Wire Wrap on Ammolite. 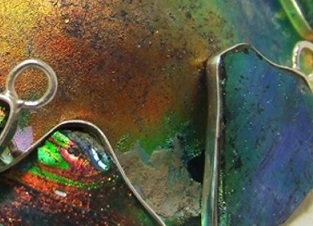 Description: Brass Cabochon Wire Wrap on Ammolite. 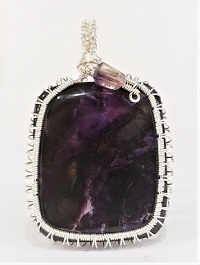 Description: Sterling Silver Woven Wire Wrap on Sugilite with Fluorite. Opal is a stone of inspiration. It helps to enhance imagination and creativity. It helps to releases inhibitions and enhances memory. Ait is a stone for love that aids in bringing happy dreams. Opal is often associated with the Heart Chakra & Crown Chakra, but varied color opals are also related to the additional chakras. 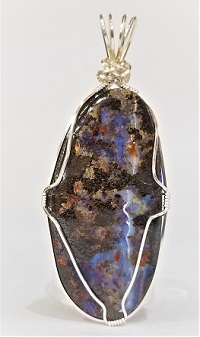 Description: Silver Plated Cabochon Wire Wrap on Australian Boulder Opal. It helps to enhance imagination and creativity. It helps to releases inhibitions and enhances memory. it is a stone for love that aids in bringing happy dreams. Opal is often associated with the Heart Chakra & Crown Chakra, but varied color opals are also related to the additional chakras. Amethyst is said to assist with healing with compulsive behaviours and addictions of all kinds. It helps to bring stability, peace, balance, courage and inner strength. Amethyst is said to be beneficial when dealing with legal problems and money issues, which can lead to prosperity and abundance. It can also help ease the pain of grief and promotes happiness. Associated with the Brow and the crown chakras. 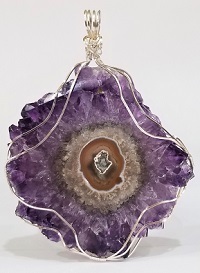 Description: Silver Plated Cabochon Wire Wrap on Amethyst. Larimar is known to be the stone of "answers from the sea of consciousness�. It helps to give freedom from self-imposed limitations & a sense of peace in finding truth. Good for calming and balancing energies. Throat Chakra & the Water element. 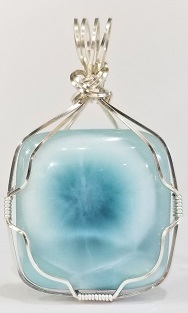 Description: Silver Plated Cabochon Wire Wrap on Larimar. 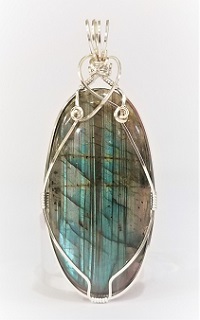 Description: Silver Plated Cabochon Wire rap on Labradorite.